It should be (and has been) noted (in yesterday's comment section) that this book is available on K*ndl* . I try never to mention this fact, and assumed someone would follow the Amazon trail and discover this for themselves. They did. And I rejoiced. In a weird way. 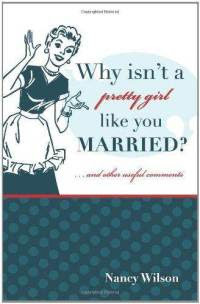 Picking up where I left off (see Part I) in our discussion of Why Isn't a Pretty Girl Like You Married? . . .
Wilson rightly spends quite a bit of time talking about the subject of contentment with her unmarried reader. Raise your hand if you are always perfectly contented with your situation in life, be you unmarried or married! What? No? Contentment is a hard one to conquer because we're selfish beings by nature and we like getting what we want when we say we want it. "Wait" is not a popular word in our vocabulary as a general rule. Therefore I found her discussion just as fitting and convicting to read as a married woman as she meant it to be for the unmarried woman. I remember being told as a teenager that if I did not learn to be content as a "single" then I would never be content married. My fifteen-year-old thought at the time was, "Well! Then I will NEVER be content!" Both the adviser and myself were right. But I don't think that contentment is a lesson that we easily learn. I certainly cannot see how this could be mastered before entering the blessed state of marriage and therefore shouldn't be the bar by which we judge whether or not we are ready to be married. (Note: I do believe a lack of contentment is a character deficiency and should be attended to. Scripture is plain and clear on the subject matter. We must strive, if necessary, to learn to be content.) Wouldn't it be lovely if we learned to be content when we were toddlers? Toddler: Mommy, may I have this cookie?" Mother: No, not now. You need to wait until after dinner. Toddler: Ok! That will be wonderful! I will happily wait to eat it later! Ta da! We've learned contentment! Cross that one off the list and move on to another! No, I really don't think it works that way. I think it's more of a lifetime refinement. I seem to becoming better at learning to be content with my present circumstances faster. But I still kick against the goad when I'm not getting my way immediately. (Why doesn't the prayer, "Make this go away, dear Lord! NOW!" work for me?!) I'm continuously learning to be content, no matter the circumstances. I don't think that's a challenge just for unmarried people -- we just tend to focus on their noticeable lack of a mate, knowing that can feel bad (for them and for us). What I'm trying to say is, what Wilson had to say on the subject of contentment can be applied to the general mass of Christian females, not just those who are without a spouse at the moment. I was laughing and nodding during this paragraph. I remember! I would feel guilty about wanting to be married. I felt like I would be laughed to scorn if I ever confessed outloud to wanting to be a wife and a mother. I thought I was discontent because I wanted something that God had not planned for me at that time and therefore I was in sin. But I wasn't! Now, of course, I can see single friends saying, "I would like to be married!" and I think it's a wonderful thing to hear. As they would like to be married, I would like to see them married because I think marriage is a wonderful thing. So we pray and we support the desire of the heart while not being miserable. Can I get an Amen?! Single or no, I believe women do "over-share" with one another and it's to our own detriment as well as those we are closest to. There seems to be a disease running rampant in the tongues of females these days. We can't seem to stop them from wagging! Every time I turn around it seems I find another tongue working some form of destruction or another and it horrifies me! This is a topic that not only the unmarrieds should pay attention to, but the married also! Keeping tabs on our tongue and processing life with a.) trusted individuals who are b.) actually in a position to help the situation or offer solid Biblical advice is something to work on! Think of how much better off we'd all be if we started paying more attention to our words. But! More on this another day. (I have a whole post brewing on the topic.) Again, my point is that this book was not just fitting for an unmarried reader, but for a married one as well. Very true that contentment is a struggle in whatever stage of life we're in. I love the distinction she makes between longing and discontent. I'm very happy that this book is available for that unmentionable reading device. I've read a wide array of books related to singles and relationships with very few amounting to anything much. This one looks promising. I remember a question years ago -- from when we were attending the church that shall remain unnamed -- that the young ladies were asking themselves, "Am I a good match?" (And, if not, "what do I need to do to ensure that I am?") I recall thinking it was a silly, misguided question. That's not the point, you know, because it places the focus in the wrong place. I'm not the biggest fan of either Wilson, but Nancy has it right in this case: it's about contentment. Contentment in the Here and Now of each of our lives is a huge part of our walk with God. Whether we be single or married it all boils down to trusting in Him to work out the beautiful plan in our lives! I was married fairly young, (I didn't feel "young" I felt just right) so I don't truly understand first hand how it feels to wait upon the LORD for a spouse, although I did go to God about the RIGHT man! However! I do see how wrapped up women get in their husbands. They expect the poor men to never fail, to always fix things just right, to read their minds, to be amazingly communicative...etc. And then when the poor man doesn't fit on the pedestal the woman made for him she mocks him in public, is derisive in front of the children and is generally discontent in her own life. And in my community the man leaves home, a lot, so the woman who is not happy within herself is miserable in her own company. This stems from the same issues that this books seems to address; Not being happy with where you are at and being afraid of expecting beautiful things from God. I liked what Shonya said yesterday about how our society now is completely disdainful about marriage and yet there is more pressure than ever for a woman to get married! Wha-huh? There is a fine line between women 'over-sharing" and women communing. We do need to talk to each other but we need to be careful of what we say. Edifying, is the key word I believe. Bravo, Sky! You beat me to it. There is such a weight of expectation put on husbands, and it is culturally acceptable to blame the man whenever the woman isn't content. Instead of looking at our (potential future spouse) as the thing that will bring contentment, complete us, whatever other baloney we accept these days, we need to view him or her as a person. Being married isn't about finding completeness in someone else, it is about giving and sharing with that person. While I am not advocating (as B put it) that we focus so much on "am I a good match", I think that we do need to ask if we are actually bringing something to a potential marriage, or if we are just looking to take. If we bring only expectations rather than a person willing to share and love, and work hard for the other. Ok. I'm a little annoyed with the term "content" right now. I'm seeing it bandied about on lots of Christian blogs. It feels like the current buzz word like "authentic" was a couple of years ago. The dictionary defines 'content' as being satisfied with the current state of things and not wanting it to change. Because I speak christianese I think the actual word people mean is 'surrender.' As in I will relinquish to God my right to seek change without his permission because I believe He knows best. Not that my desire for a certain change will go away but that I won't act on that desire unless I believe God is leading me to. Somehow 'content' is more palatable than surrender. You can't even mention the KINDLE???? I did click through and look at this author. Have you read any of her other books? Looks like she has some good ones on womanhood in general. And she seems pretty wise. Stephanie, I like that you pointed out the difference between contentment and surrender! It is an issue that should be addressed more in Christian circles. Of course you cannot be content without first surrendering everything to the Father! In my post I used 'content' in its actual context of being satisfied. But in trusting God and being content there absolutely MUST be surrender to His plan. It is in that surrender, the working of our best to Him and trusting He will bless our efforts and leave the rest for Him to work out, that we find contentment. This is the peace that passeth understanding and pervades our entire being.